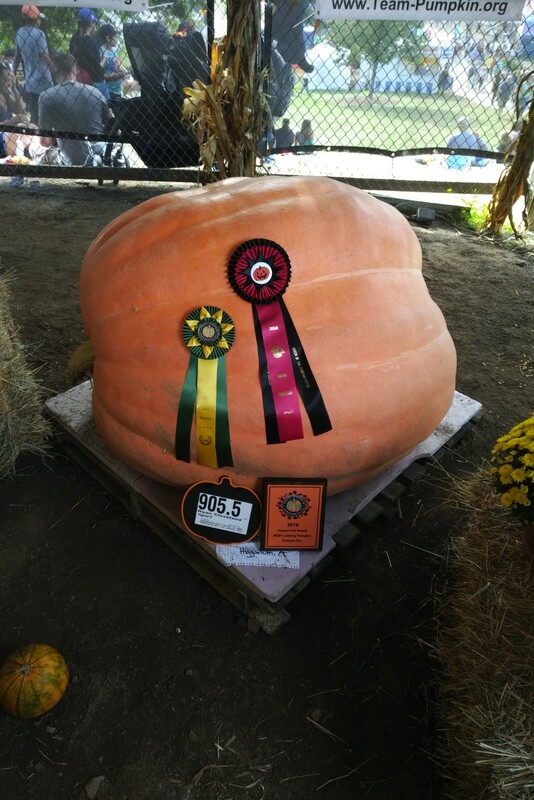 The Durham Fair in Durham, Connecticut is my final stop on Competition Season 2018. And although I got stonewalled by the New York State Fair this year (one entry in, no ribbons), some of my pictures have picked up sweet silks at other venues and competitions. 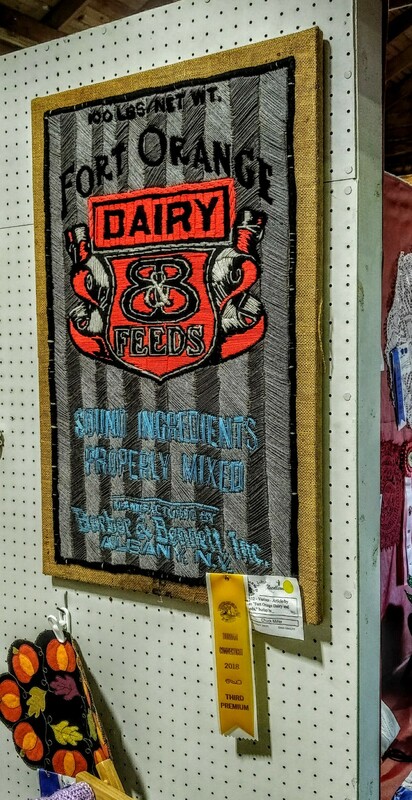 And right now, three photos – as well as one of my burlap stitching projects – are at the Durham Fairgrounds, already judged and carefully displayed. I can’t wait to get there and see them. But the whole thing was overshadowed by … shall we say … a major issue that had nothing to do with the photography or needlework divisions. Normally I ship my photos to a friend who lives in Durham; he brings them to the Fairgrounds, I visit the Fair and see how they did, I go home, he picks up the items and ships them to me. Easy peasey. This year, because I had a stitching project as well as my photos, I didn’t want to impose on him to drop off entries in two buildings, so I decided to bring the items myself. Pick-up at the Fair is 7:00 p.m. on Sunday, so we’re okay there. I’ve been to Durham a few times, I know to park at the Strickland Farm a couple of miles away and ride the shuttle bus to and from the Fairgrounds. Hey wait a minute. Where is everybody? The Strickland Farm is usually filled with cars and shuttle buses … there’s no one here. No cars, no volunteers, no NOTHING. I backtrack. Wait. There’s signs for Durham Fair parking. It’s not near Strickland Farm. Perhaps it’s in another location that’s closer. About a five mile drive … and I come across an apple orchard and a row of cars trying to park in the apple orchard. Okay, I’ll join in. Thirty minutes later – it’s a long line – I arrive at the parking lot entrance. “Are you parking for the Durham Fair?” a man asked me. Tilcon? What the hell is a Tilcon? And as I followed the man’s directions … I drove two and a half miles, I found the intersection and turned right … and I found Tilcon. Tilcon is a stone quarry. And the parking lot volunteers were putting cars all over the stone quarry grounds. “You can’t park here,” the volunteer said. “But it’s open,” I replied. “No. You have to park that way,” he said, pointing in the distance. They put me about three miles into the stone quarry. Another mile walk to a shuttle bus. Eventually I arrived at the Durham Fairgrounds. Okay. Better late than never. And I found out that because of torrential rains during the week, the Strickland Farm was unavailable for parking, in that the cars would have sank into the muddy ground. Nice to know that AFTER I spent an hour schlepping around, looking for an alternative parking spot. Now it’s time for some sightseeing. Check out the size of this beast. Nine hundred five and a half pounds of pumpkin. What do you figure that would make in terms of pumpkin pies? Three? Four?? Okay. Let’s now go visit the needlework building and see if my Fort Orange Dairy and Feeds burlap stitching project can improve on its second-place silk at Altamont. Well looky there. A third-place ribbon for the artwork. Sweet. Not bad for a first-timer. 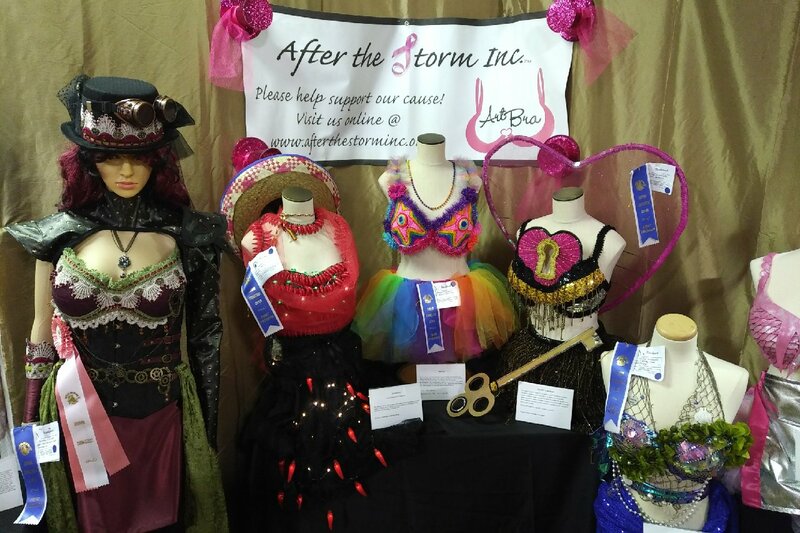 I should note that the needlework building offered a special “challenge” theme this year, in which the entrants were challenged to design special brassieres for victims of breast cancer. The entrants’ efforts were noble and excellent. And fashionable, too. Okay. Now it’s off to the personal skills building. 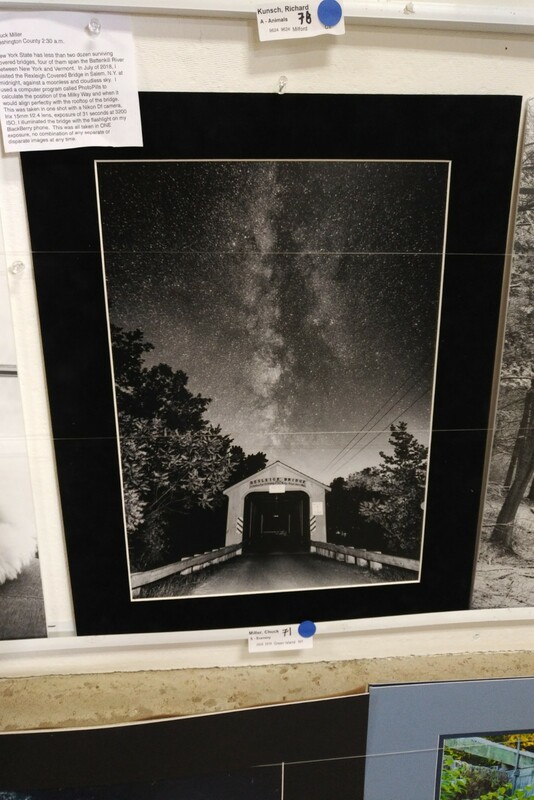 I have three entries at Durham – Infrared Horizon 787, my infrared picture which has not claimed a single strand of silk all summer; The Mahari Stream, which has a third-place at Altamont and a second-place at the Big E; and Washington County 2:30 a.m., my Rexleigh Bridge and Milky Way photo that has a chance to become my third-ever “triple blue” claimant, after The Jumbuck and Jesus Saves. 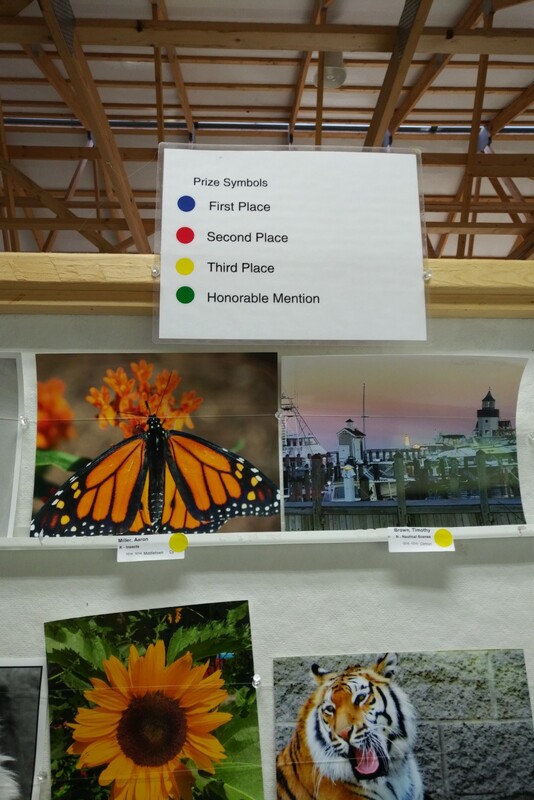 Now in lieu of physical ribbons, the Durham Fair offers a “sticker” system where colord dots represent the ribbons an entrant would receive. Entrants are given their physical ribbons (and prize money) after the Fair. Dang it. No ribbon. Nertz. Oh well, I guess it’ll just have to be as it is. Red dot for second place! First ribbon ever claimed for this shot! “Where do you get that film?” he asked me. Well well well. A blue dot for a blue ribbon, third blue for this picture – making Washington County 2:30 a.m. a triple blue claimant, having achieved blue in Altamont and the Big E previously! Swank! Okay, it’s Competition Season 2018 recap time. The AGFA Bridge Over Ansco Lake earned its fourth silk – and second blue – at the Iowa State Fair, my first blue ribbon in that competition. Washington County 2:30 a.m. became my third “triple blue” shot – my first “triple blue” captured with my Nikon Df – and my first “triple blue” with nocturnal photography. 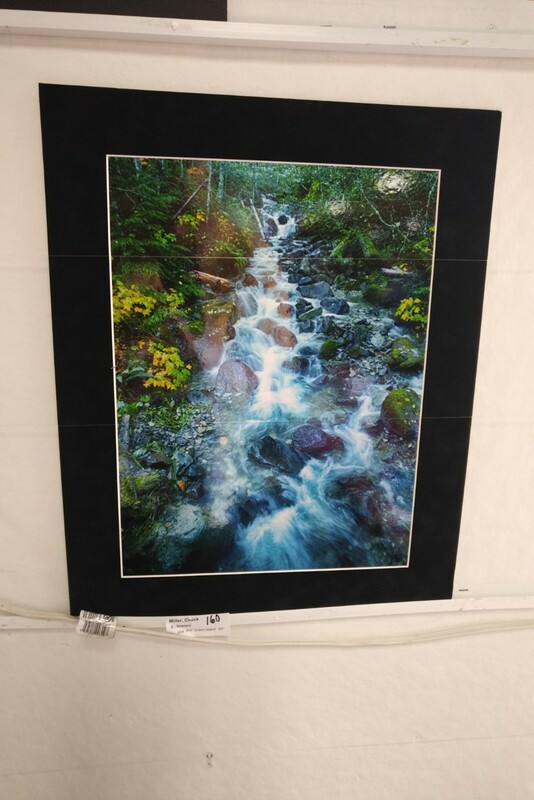 The Mahari Stream is my first-ever ribbon-winner based on a photo from Washington State. 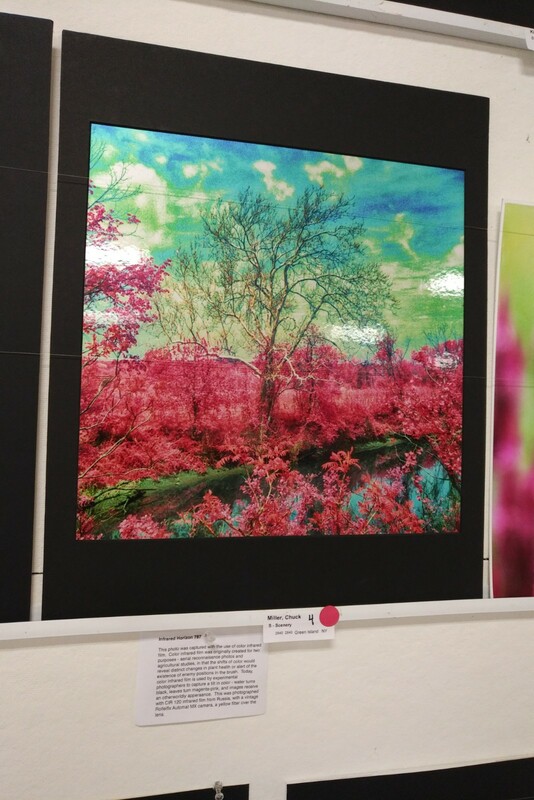 American Dreamtime: Solarcan 368 didn’t win any ribbons, but it DID get on the walls of the New York State Fair photo competition, my first image on the walls of the Harriet May Mills Art Center in three years. All three of my burlap stitching projects have earned silks – a second and a third place for Fort Orange Dairy and Feeds, an honorable mention for GLF Quality, and a third-place ribbon for Eastern States Farmer’s Exchange. And I would be remiss if I didn’t show some love for the Saratoga Vichy Crate Art Project, which claimed a third-place in the “recycled” category at Syracuse. Okay, now it’s time to head home. I have to wait to pick up my artworks – they’re not released until 7:00 p.m. No big deal, I’ve dealt with that at Altamont. And the Fair has ended. Everybody’s leaving. Ugh. I thought that at least the fair would keep going for a couple more hours. I have to move fast. I find the Needlework building. I’ve got my artwork. Now it’s time to find the shuttle bus and get back to the Strickland Farm – er, Tilcon quarry mine. It’s 7:30 and they’re packing attendees on the bus like they’re loading sardines into a tin. I’m parked at Tilcon spot 4. The bus drops people off at the semi-well-lit Tilcon spot 1, and the sorta-well-lit Tilcon spot 2. When they get to Tilcon Spot 4 … it’s nearly pitch dark. “Do you know where your car is?” the bus driver asked me. I get off the bus. A woman and her child get off the bus as well. We can’t find our cars in the inky darkness. “Mommy, I’m scared,” the little girl whimpered. I placed my car’s key fob under my chin and pressed the unlock button on the fob. A flash of light. See, a keychain remote control is amplified if you put the remote under your chin. This is why I watch shows like Outrageous Acts of Science for cool trivia like this. Dracourage was WAY over there. In an area so dark, I could have pulled out my tripod and my Df and re-shot Washington County 2:30 a.m. against a stone quarry excavator. And “Alice” was parked a few feet away from Dracourage. I made sure the woman and her child got in their car, and were able to drive off before I left the quarry. Common courtesy, don’tcha know. So yeah, ,that was a scary, scary situation at Tilcon. That’s a stone quarry, not a parking lot. They put cars all around with no rhyme or reason as to how those cars would get out of the quarry after the Fair ended. The few floodlights that were in the quarry were quickly removed as night fell – which was counter-intuitive to peole actually, I don’t know … NEEDING TO FIND THEIR CARS? So if I do this next year, I’m going to call ahead. If Durham has the Strickland Farm as a viable parking location, I’ll park there and find my way home afterward. But if they shift me over to the Tilcon stone quarry again … then I’m going to rent a hotel room in Durham, visit the Fair during the day, leave before sunset, spend the night, and pick up my goods Monday morning. but no kid should be traumatized like that. We can do better than this, can’t we Durham Fair? Hmm??? Who’s the right Captain Marvel? It was great getting to chat with you yesterday! I will play with that app the next time I head to the beach so I can plan my shot. Also truly thank you for the picture. I think I know right where I will display it. It is just so tranquil and serene. Look forward to competing with you again next season!